Would you like to be able to do Angel Card Readings? They can be amazingly accurate and give us comforting guidance when we need it the most. all we have to do is believe in ourselves and our ability to communicate with our Angels. If you would like to tap into your own abilities and do Angel Card Readings yourself , simply follow the steps below. Choose a deck which you are naturally drawn to - which ones do your instincts tell you are right for you? There are numerous decks available by various Angel Card Authors, and they can be bought from bookshops, new age/spiritual shops - also by mail order on-line. Some decks have the full Angelic messages on the cards, others have a short message and a guide book which expands on the full meaning. If buying from a local shop ask the owner if they have open decks that you can look at and get a feel for. If purchasing on line see if there are images of samples of some of the cards - also testimonials from those who have purchased the cards already. Any good on-line outlet will have a contact form in order that you can ask questions if you want to. Getting to know and attuning to your Angel Cards. Some Angel Card decks come with a guide book including instructions on how to approach this - my own Cards come with an "Attuning to and working with your Angel Cards" document. Step 1. Take a quiet moment by yourself to open your cards. Step 2. Hold the cards to your heart and ask your Angels to bless them and to help you to read the cards accurately. Step 3. Now go through the cards, touching every one in turn to infuse them with your energy. Step 4. “Play” with the cards – read them, shuffle them, fan them out, spread them out on a table or on the floor – whatever you feel that you want to do. All of these actions energise the cards and tune them in to your own vibrations – familiarising yourself in this way will enable you to connect to the cards with both your conscious and sub-conscious self. ♥	Still your mind, hold the cards to your heart and ask the Angels to communicate clearly through the cards. ♥	When doing a Reading for yourself, simply ask your Angels to either answer your given question or to just tell you that which they want you to know by guiding you to choose the relevant cards. ♥	When doing a Reading for someone else, dedicate the cards to whomever you are doing the Reading for. You will most likely find your own words, but you could try something simple such as “I dedicate these cards to ******* (here you can also give their date of birth, location and any other details that you want to), please, Angels, help me to give them a true and accurate reading that will help and guide them in the best possible way that we can”. You can say this silently to yourself if you wish. ♥	Shuffle the Angel Cards until you feel guided to stop and then choose the first card that your instinct takes you to. You may like to choose just one card or continue to do a three card spread in the same way. 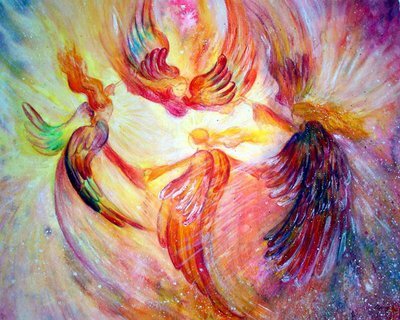 Whatever feels right for you will be absolutely right with your Angels. ♥	Study the messages on each card. Please trust your intuition when reading your messages, your first instincts will invariably be right when interpreting how the message relates to you and your current circumstances. If the Reading is for someone else, ask them to do the same - trust their instincts when interpreting the messages you are passing to them. ☆	Always do the readings in a quiet room or place, away from any other distractions. ☆	Sometimes a card will fly from the pack whilst you shuffle, or simply stick out. Always pay extra attention to these cards as they are special messages from the Angels. ☆ Have faith in your ability to choose the right card(s) when doing a Reading. If it helps, remind yourself that your Angels are your guiding hand and that they are ultimately the ones who are choosing the cards for you. ☆	Remember that often the messages from the Angels contained in a reading will have immediate relevance, but sometimes it may be up to several weeks before you or the person you have read for will think back to the reading and realise what it was that the Angels were trying to communicate. ☆	Always remember to say “thank-you” to your Angels after every Reading. ☆	Whilst you are not using or carrying your cards with you, store them in a light and airy place with, or surrounded by crystals, Angel figures or something else that is special to you – you will instinctively know where and how you want to keep them because again, you will be guided by your Angels. ☆	The most important thing is that you get pleasure from using your cards – enjoy!